"I watched IS beheading Christians"
A 16-year-old Eritrean migrant who escaped captivity under the Islamic State (Isis) in Libya has exclusively told IBTimes UK that the jihadists forced him to watch the beheading and shooting of Eritrean and Ethiopian Christians. Nael Goitom fled IS captivity along with four other Eritreans minors on 7 April after the extremists decided to move their Libyan camp in the desert to get away from fighting in the area. “We thought: it’s better to try to escape than to wait to be slaughtered by them,” he told IBTimes UK in an interview. They walked for four days before reaching a settled area and asking for help. Under more than a month of IS captivity, the Christian boys were forced to learn the Koran to become “Cubs of the Caliphate”. “They asked us ‘what do you choose, to be killed or to become Muslims?’ Of course we choose the latter. ‘We’ll fight for you’, we said,” Nael said. But the most harrowing account regards the execution of dozens of Ethiopian and Eritrean Christians in Libya by IS militants, which was shown in a 30-minute video featuring extensive rants against Christianity and the West. The final part of the clip shows a group of men dressed in black who are said to be hostages in southern Libya held by a group of IS fighters clutching machine guns. Then, the prisoners are shot in the back of the head. The video also depicts masked militants escorting a group of men in orange jumpsuits along a beach. The men’s severed heads are later shown in the sand. “Then one day they came over and brought black clothes and asked 47 people to wear them. Then, they took them to the sea. They also carried 10 minors, I was among them. I saw when IS shot them dead. We kept screaming,” he continued. The jihadists reportedly did the same with the rest of the group – about 14 people – who were forced to wear orange jumpsuits. “We were forced to watch IS cut their heads,” Nael said. The boy was kidnapped on 3 March after he crossed Libya from Sudan along with other 61 Eritrean men, 10 Eritrean women and 8 Ethiopians. About 20 or 30 armed IS members stopped the Tripoli-bound caravan of migrants in the middle of the southern Libyan desert and they started asking religious questions. “They wanted to know who was Muslim among us. We Christians had crosses and pictures of Jesus, so we really couldn’t hide it,” he said. Somalians were allowed to continue, while Eritreans and Ethiopians were driven to the IS camp in the desert. There were about 300-400 members of the jihadist group in the camp and for days the prisoners, who were tied and held in a large hole, were told that “the boss will come and decided our destiny”. Nael recognised three Eritreans fighting for IS. “We hoped they were going to help us, but instead they showed no emotions,” he said. 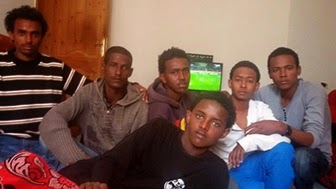 After his escape, Nael and four other minors – Yohannes Mebrahtu, Thomas Ghiwet, Abraham Naizghi and Aman Shishay – walked for four days before running into a Sudanese man who drove them towards the Sahara where most of the refugees gather. Then, a smuggler got them into Tripoli, where Nael’s brother lives. Despite the lucky escape, Nael is still traumatised by the ordeal.